Balloons always make a room feel more festive. 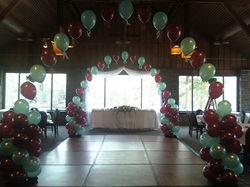 We can custom design arches, columns and centerpieces to match your style. Whether it is a wedding or a shower, trade show or company picnic, communion or bar mitzvah, we can help create the right kind of atmosphere. All the decorations can be combined with special effects such as smoke machines, air powered confetti cannons and balloon drops just to name a few. Just a few of the many decorations we can create are: balloon arches, columns, centerpieces, surprises enclosed in balloons and bigger than life balloon sculptures. Visit our gallery to see other decorations we have done. Trust the design team at Aardvark Entertainment. We can create anything from a single centerpiece to a fantasy land that will amaze your guests. These works of art are only limited to your imagination.